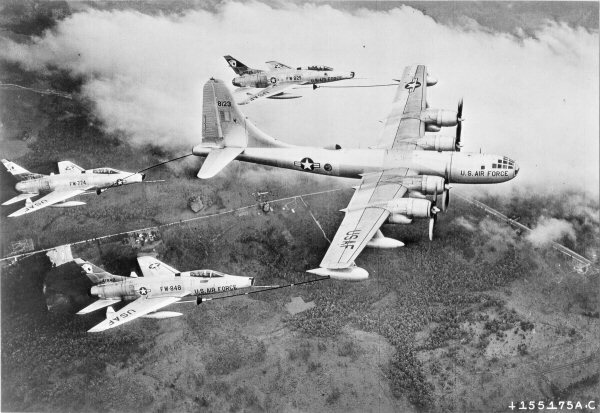 A U.S. Air Force Boeing KB-50 Superfortress (s/n 48-123) (c/n 16004) of the 622d Air Refueling Squadron (4505th ARW) carrying out first triple-point refuelling operation with three North American F-100C Super Sabres (54-1825, 53-1774, 54-1848) of the 451st Tactical Fighter Squadron (322nd TFW), 1956. (note: the initial tanker conversions were designated KB-50 regardless of the original sub-type). The 622d Air Refueling Squadron was established in 1955 by Tactical Air Command to provide dedicated in-flight refueling, initially for F-100 Super Sabres and later for other in-flight refueling capable TAC fighters, fighter bombers, and reconnaissance aircraft. The squadron was initially equipped with transferred Strategic Air Command (SAC) KB-29M Stratofortrresses that were converted to aerial tankers using a British-developed Probe and drogue refueling system. The squadron re-equipped with KB-50 Superfortress in 1957 which provided greater speed to refuel jet aircraft. KB-50s were modified about 1960 to the KB-50J configuration, which added a J-47 turbojet engine underneath each wing in place of the auxiliary fuel tanks in order to further increase the speed of the aircraft while conducting air refueling operations. By 1963 aircraft were phased out due to age. SAC, with KC-97s and KC-135s became the Air Force's single manager for air refueling. The squadron inactivated in early 1964 when KB-50Js sent to AMARC at Davis-Monthan AFB, Arizona. The 622d Air Refueling Squadron served with Tactical Air Command (TAC) beginning in 1955. It was last assigned to the 4440th Aircraft Delivery Group at England Air Force Base, Louisiana, where it was inactivated on 1 Apr 1964. **	18 Jul 55: Activation at England AFB, La., with KB-29s. Maj C. J. Cordill in command. **	10 Sep 55: LTC D. A. Shaver assumed command. **	12 Jun 56: Maj L. F. White in command. **	10 Dec 56: Maj E. R. Saunders assumed command. **	5 Apr 57: Received first KB-50. **	1 Jul 58: Unit assigned to 4505th ARW. **	Jul 58 - Jan 59: History not available. **	1 Jul 62: Maj W. A. Williams assumed command. **	12 Oct 62: LTC R. W. Harris in command. **	8 Oct 63: 4505th ARW deactivated. 622nd placed under 4440th Air Delivery Group pending deactivation.